Wherever we look in today’s world we see all kinds of suffering and difficulties – conflicts, epidemics, famine, frost, hailstorms, droughts and other natural and man-made disasters that have been happening and continue to happen. Moreover, our Tibetan kinsmen have been facing great difficulties, driving some of them to resort to drastic measures such as self-immolations, under the influence of heated emotions. In this critical time, I feel that we should empathize with their suffering. 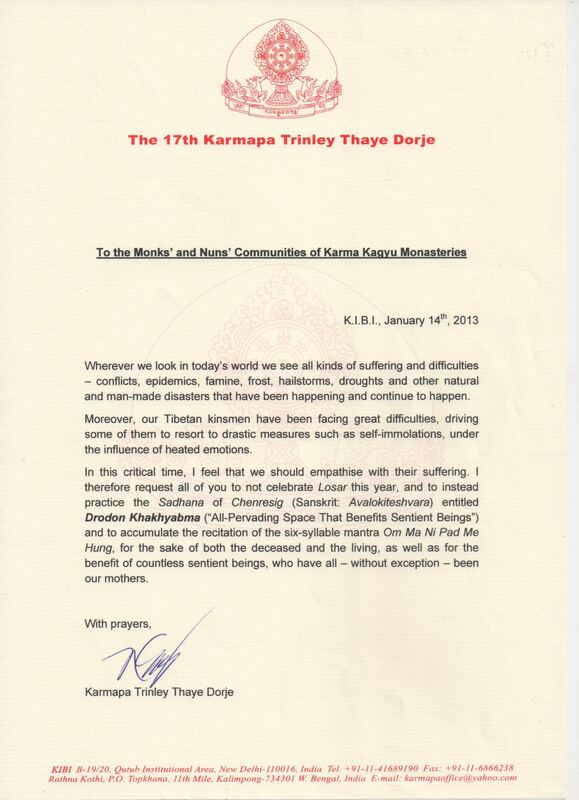 I therefore request all of you to not celebrate Losar this year, and to instead practice the Sadhana of Chenrezig (Sanskrit: Avalokiteshvara) entitled Drodon Khakhyabma (“All-Pervading Space That Benefits Sentient Beings”) and to accumulate the recitation of the six-syllable mantra Om Ma Ni Pad Me Hung, for the sake of both the deceased and the living, as well as for the benefit of countless sentient beings, who have all – without exception – been our mothers.